So you’ve booked your trip and you’re now ready to find a few things to do in Whitstable, Kent. Whether you’re a foodie, an academic, or an adventurer, there’s more action in every nook and cranny of Whitstable then you could even imagine. To help you whittle down your itinerary, here’s a list of the top 11 things to do in Whitstable, Kent. As soon as you arrive in Whitstable, you’ll probably be famished. Lucky for you the seafood here is absolutely to die for. Wheelers Oyster Bar – This is the town’s oldest restaurant and a mecca for oyster lovers. Come partake in this oyster oasis right when they open each day at 10:30 am, or 11:30 am on Sundays. Samphire – This rustic bistro is home to some of Whitstable’s finest local fish, meat, and seasonal greens. If you find yourself enticed by this description, catch them during their hours between 10am and 10pm. These are just a few of the many excellent seafood options available to you during your stay. Additionally, if you find yourself visiting in the midst of the Whitstable Oyster Festival, then you’d better be properly prepared for a culinary frenzy. Whitstable’s harbour is the focal piece of the community. It’s what drives the community’s lifestyle and fuels their tourism industry. If you’re looking to simply take a few leisurely walks in Whitstable, the harbour is the best place to do so. Organised educational tours and informative nautical lectures happen all around the harbour on a daily basis. The wildlife you can see around the harbour is vast and impressive. Seals, migratory birds, and uncanny species of fish, all flock to Whitstable’s harbour. The harbour is the heart of Whitstable and you’d be selling your trip short if you never check it out. For more information visit www.whitstableharbour.org. At Whitstable’s Harbour Market you can shop, eat, and take in the talents of local artisans and craftsmen. Enjoy the paintings, drawings, prints, and photography of local artists, or even purchase a work to remember your trip by. Looking to pick up an accent piece for your home? The Harbour Market is the place to pick up those uncanny knick-knacks and furniture with character. Deck yourself out with some of Whitstable’s finest boutique jewelers and designers. The market opens at 11am on Monday, Thursday, and Friday, and 10am on Saturday and Sunday. For more information about the Harbour market, visit www.harbourmarketwhitstable.co.uk. While you’re here, why not take in a show! Whitstable’s Playhouse Theatre is notorious for their enthralling performances and charming productions. If you’re hungry for a little entertainment, then the Playhouse Theatre has to be on your to-do list. The Lindley Players and Lindley Players Youth Group put together shows year round. Classic musicals, comedies, and dramas, as well as some theatre more on the cutting edge, can all be seen here. Even if the theatre isn’t normally your bag,Whitstable’s playhouse theatre promises to be a riot for everyone in your party. Everyone’s got a little shop-aholic inside them! If you’re looking for a token to remember your trip, or to give to a loved one who couldn’t make it, then any one of Harbour Street’s many gift shops are sure to suit your fancy. Urbanista Retail, Mosaic, and Seagulls & Flamingos are some of the top shops on Whitstable’s historic Harbour Street. Here you can find those little keepsakes to keep a little piece of Whitstable wherever you call home. Postcards, T-shirts, and lawn ornaments are just a few of the many odds and ends you can find here on Harbour Street. Harbour Street’s gift shops are a must for every tourist who comes to Whitstable. Never forget your trip, thanks to a sentimental purchase from a Harbour street gift shop. For many, a vacation is as much a time to expand their mind, as it is a chance to relax their muscles. The Horsebridge Arts and Community Centre is here to give you unparalleled and authentic taste of Whitstable. Here you can catch a matinée of a classic film. They also have a robust lineup of classes and outings to satisfy your inner enthusiast. Additionally, the staff here are local cultural and historical experts, so all of your inquiries and curiosities can be satisfied here at Whitstable’s cultural hub. Be sure to stop by and catch one of their community events so you can meet the town, find out what’s on in Whitstable, and really get a taste of what life is like here. Unlock your inner explorer by spending a day paddle boarding around Whitstable’s seafront. It’s not as difficult as you think! The stand-up paddle boarding experience takes a little practice, but is the perfect way to see Whitstable’s entire coastline. Shops like Oyster Coast Watersports, on Long Beach, can outfit you with all the gear and know-how you need to get started. Paddle boarding is as much fun as it is intimidating. Once you get the hang of it, you won’t want to stop until you’ve seen every inch of Whitstable bay. While Whitstable can only truly be experienced outdoors, if you find yourself caught in a rainstorm while you’re here, consider heading over to the local bowling alley! MFA Bowl in Whitstable is the best place in town to have a little indoor fun. They’ve got great deals on food, drinks, and games, and is an excellent way to spend a rainy evening in Whitstable instead of sulking in your room. Bowling might not be the consummate Whitstable experience, but that doesn’t mean it’s not a whole lot of fun! If you’re looking to catch a wave, carve the sea, or ride the wind, you’d be hard pressed to find anything as exhilarating as surfing, windsurfing, or kitesurfing in Whitstable. Deciding which is right for you can be tough, but a lot of fun is guaranteed no matter what you choose. Surfing is pretty straightforward, Windsurfing requires a little more finesse, and Kitesurfing is sure to be the ride of your life. Once again, shops like Oyster Coast Watersports are your resource for all things extreme and aquatic. So come and carve up Whitstable’s coast however you like, and catch a glimpse of the town’s beautiful coastline while you’re at it. Whether you just need a moment’s peace from the kids, or need to take out some frustration on a tiny white ball, Whitstable’s scenic golf course can provide you with 9 holes of bliss. Whitstable Seasalter Golf Club Ltd is a highly regarded golf course, located right here in Whitstable. Beyond grabbing a quick 9, the club also hosts a wide range of social events and competitions for all ages to participate. Come find your sanctuary and serenity at Whitstable Seasalter Golf Club Ltd, and earn yourself some much needed relaxation. At the end of the day, you may just want to do is kick back with a couple drinks, a few friends, and the beautiful sights of Whitstable beach. Beach huts are available to rent through a number of different agents. Try Beach-Huts.com or BeachHuts4Hire. If you fall in love with Whitstable as much as we know you will, then why not go ahead and rent out your own slice of this seaside paradise. 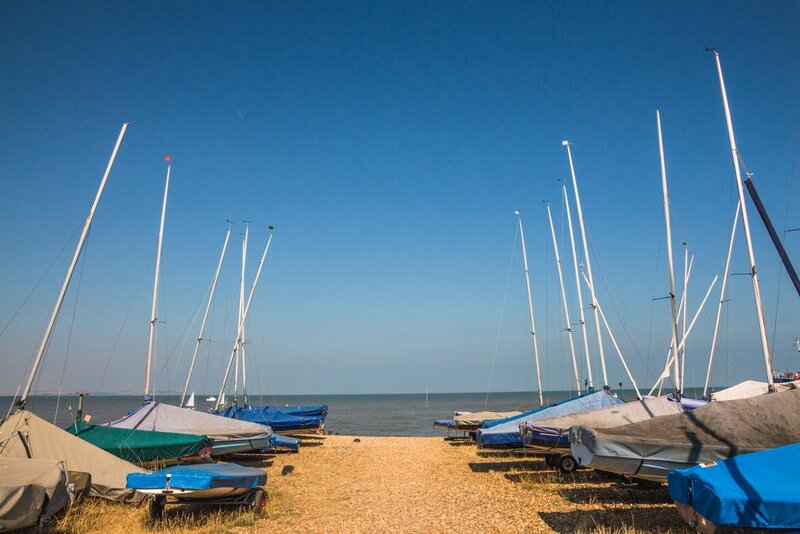 Your trip to Whitstable, Kent should be as stress-free, yet all-encompassing as possible. Yorke Lodge has already provided you with comfortable lodging and a host of amenities. Now it’s up to you to go out, and make this vacation one to remember using our list of things to do in Whitstable. If you want any other ideas for things to do during your stay at Yorke Lodge, do ask Vicky.